Interested in Game of Thrones? Add Game of Thrones as an interest to stay up to date on the latest Game of Thrones news, video, and analysis from ABC News. After eight years, 67 episodes and many, many gruesome deaths, winter is finally here. The premiere episode of the eighth and final season of "Game of Thrones," titled "Winterfell," debuted Sunday and 17.4 million viewers tuned in, according to HBO. We even were treated with a brand new opening animation featuring not the usual overview of the seven kingdoms of Westeros, but only Winterfell and King's Landing, where the events of the final season take place. We left last season with the Night King burning down the wall while atop a zombie version of the dragon Viserion, while Daenerys and Jon Snow -- the true heir to the Iron Throne -- were in the throes of passion, blissfully unaware they're related. But we start where this whole epic began: with a caravan riding into Winterfell. Jon and Daeny ride into Winterfell with the Mother of Dragons' giant army of Unsullied and Dothraki soldiers, as well as a number of familiar faces, including Tyrion, Gendry and The Hound. The famously stubborn and insular Northerners look on nervously, and then gasp in a mix of fear and amazement as Daeny's two dragons, Drogon and Rhaegal, roar over the home of the Starks. Jon is finally reunited with many of his Stark siblings, including Bran, whose whole "I'm the Three-Eyed-Raven" thing may allow him to see the past, present and future, but doesn't equip him with great social skills. Meanwhile, Sansa meets Daeny for the first time, and she tells her through gritted teeth Winterfell is now hers. The tension between the two is immediately interrupted, however, when Bran informs everyone the Night King has broken through the wall, and Viserion is now a zombie. Inside Winterfell, Daeny is introduced to the Lords of the North. Everyone's favorite pint-sized leader, Lyanna Mormont, asks Jon why he pledged loyalty to another queen when his people deemed him the King of the North. Jon says title isn't important: his main concern is protecting the North. Tyrion then assures everyone they've assembled the greatest army in history to combat the White Walkers. That army, he says, happens to include noted Northern enemies the Lannisters, which is met with boos. Sansa, meanwhile, asks how she's supposed to feed all the soldiers in the "greatest army." "What do dragons eat, anyway?" she asks, pointedly. "Whatever they want," Daenerys replies. Outside, Tyrion and Sansa have an awkward reunion; the former married couple hasn't seen each other since Joffrey choked to death from poison at his own wedding. Tyrion calls that wedding a "miserable affair," but Sansa contends it "had its moments." Everyone watching presumably nods in agreement. 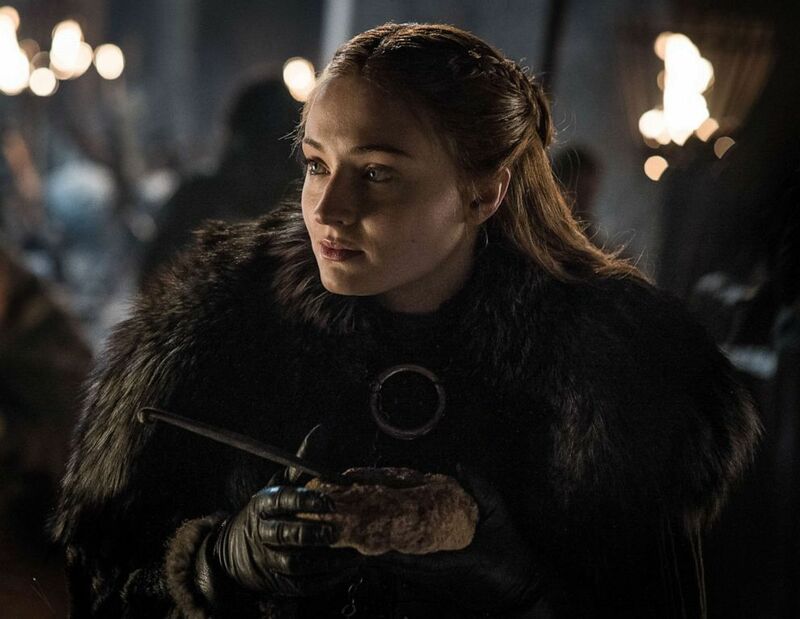 Sansa then questions whether Tyrion actually believes Cersei will be sending her army to help fight the White Walkers -- which, of course, we know she's not. Tyrion says he does, prompting Sansa to reply she used to think Tyrion was the "cleverest man alive." Following that awkwardness, we have another Stark reunion as Jon finally sees Arya. The two compare swords, and Jon asks Arya if she's ever used hers. "Once or twice," she replies -- perhaps the understatement of the episode. Sophie Turner as Sansa Stark on season 8 of "Game of Thrones." We then travel to King's Landing, where Cersei's Hand of the Queen, Qyburn, informs her the White Walkers have broken through the Wall. "Good," she replies, as she looks over her fleet, commanded by Euron Greyjoy, who's still keeping his niece, Yara, prisoner. As Euron mocks Yara, she tells him he's going to be on the losing side. He doesn't seem to care one way or another, since he's more concerned with bedding Cersei. In the King's Landing throne room, Cersei takes stock of her new mercenary army, the Golden Company, led by Captain Strickland. While she's disappointed the Golden Company didn't bring its famed elephants, she's pleased with her new military force. Euron, meanwhile, attempts to put the moves on Cersei, who tells him he has to wait until the war is over to get what he wants. Euron persists and Cersei threatens to behead him if he doesn't stop his insolence. She starts to walk away, but then turns back with a knowing look. An eager Euron follows her. We then find Bronn in, of course, a brothel. He's accompanied by three prostitutes who complain about favorite customers getting burned by Daeny's dragons, including a red-headed man named Eddie, whose eyelids were burned off. Some viewers probably assumed they're referring to season seven guest star Ed Sheeran. Bronn is then rudely interrupted by Qyburn, who says Cersei has a task for him. Qyburn hands Bronn the crossbow Tyrion used to kill his father, Tywin, and tells him to use it to kill Cersei's brothers, Jaime and Tyrion. Catching up with Cersei and Euron, the Greyjoy asks how he compares to her past lovers, including Jaime. Cersei declares Euron the "most arrogant man" she's ever met, which counts as a compliment, apparently. Euron declares he's going to "put a prince [Cersei's] belly," unaware there's a already a bun in that oven, courtesy of Jaime. While Euron's busy, his nephew, Theon, boards his ship and rescues Yara. She plans to retake the Iron Islands, their former home, but sees Theon wants to help the Starks and make up for his many, many, many mistakes. She tells him to return to Winterfell. Back in Winterfell, Tyrion speaks with Davos, who contends that Daeny needs to earn the loyalty of the Northerners. One way to do that, he suggests, is if Jon and Daeny marry. Right on cue, we cut to Jon and Dany talking. As Daeny explains she can tell Sansa doesn't like her, two Dothraki soldiers interrupt to tell her her dragons have eaten 18 goats and 11 sheep -- which, apparently, means they're "barely eating." "Nobody does, until they ride a dragon," Daeny replies. Jon scrambles aboard and the two fly over Winterfell. They land by an isolated waterfall, and Jon comments the climate is "cold up here for a southern girl." "So keep your queen warm," Daenerys replies. They kiss, but the mood is almost ruined when Drogon growls. Daeny teases Jon not to worry and they resume their kiss, but Drogon continues to stare at Jon, perhaps sensing his true Targaryen nature. Back in Winterfell, Gendry has made a new axe of dragonglass for the Hound. Arya then shows up, in another reunion moment. The Hound is less thrilled to see her, since she left him to die, but he commends her for her survival skills. Arya and Gendry start some flirtatious talk -- she tells him not to call her Lady Stark, and he replies, "As you wish, m'lady." What she does wish, however, is for Gendry to build a dragonglass weapon for her, too. Meanwhile, we find Jon and Sansa arguing over his decision to bring Daeny and her dragons to Winterfell and to renounce his crown as King of the North. She asks him if he bent the knee to Daenerys to save the North or because he loves her. We don't get an answer, though. Instead, the scene cuts to Daeny and Jorah, who's introducing his queen to Samwell Tarly. She thanks Sam for curing Jorah's greyscale, and Sam asks for a pardon for stealing books from the Citadel and for his family sword. Daeny realizes she had her dragons burn Sam's father and brother to death for refusing to bend the knee to her. After relaying this awkward fact, a tearful Sam excuses himself. Sam runs into Bran, who tells him it's time to inform Jon of his true lineage -- that he's the son of Lyanna Stark and Rhaegar Targaryen, and the true heir to the Iron Throne. It must be Sam to tell Jon, Bran explains, since Jon trusts him more than anyone. Sam finds Jon, and first asks if he knew Daeny had his father and brother killed -- and if Jon would've done the same. After all, he's spared people in the past. But he wasn't a king, Jon replies. That's when Sam drops the bombshell: he's the king of the "bloody Seven Kingdoms." He lays out Jon's real family history, explaining his real name is Aegon Targaryen, and he's the true King of Westeros. In disbelief, Jon insists Daeny is the rightful Queen, but Sam maintains that Jon belongs on the Iron Throne, not her, and that's the truth. Meanwhile, wildling Tormund Giantsbane leads a party to survey the damage left by the Night King and his army of White Walkers. They find a young boy nailed to a wall, with severed human limbs surrounding him in a pinwheel. The Lord of Light-worshiping Beric declares it to be a message from the Night King. Suddenly, the boy comes to life as a White Walker and lets loose a terrible screech before Beric stabs him with his sword of fire, . Back in Winterfell, a hooded figure arrives on horseback. It's Jaime Lannister, who turns and stops cold, his expression shocked. Returning his gaze from his wheelchair is Bran, in the first time Jaime's seen him since he pushed him out of a tower window in the very first episode, paralyzing him. And the picture cuts to black. "Game of Thrones" returns next Sunday at 9 p.m. ET on HBO.